Q: What is this series about? A: It is about two girls who find a magic forest where talking animals live. A bad guy witch named Grizelda is trying to get all of the animals out of the forest so that she can have it. Q: Can you tell me what happens in the first title, Lucy Longwhiskers Gets Lost ? A: Jess and Lily help run a Helping Paw Wildlife Hospital. They find a stray cat named Goldie that has an injured paw. They fix the paw and then let the cat go again. After a few days they see it again. Then it runs off. They follow it going across a stream into a huge tree. Suddenly the tree sprouts leaves and sparkles. Then, Jess and Lily notice some letters carved into the tree. This tree leads into Friendship Forest, which is a magical place. 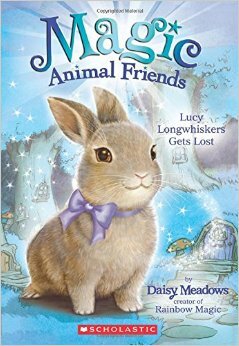 In this book a small rabbit named Lucy gets lost. Some giants, called the Boggits, who help Grizelda, capture her and put in a cage. Jess and Lily rescue her and go back home. 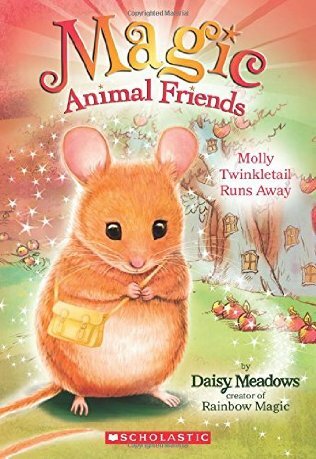 Q: Tell me what the second book, Molly Twinkletail Runs Away , is about. A: Jess and Lily follow Goldie back to the tree. Upon entering the magic forest, they discover that there is going to be a fair. A small mouse called Molly gives them some nuts and rushes off to the Treasure Tree. Then Grizelda comes and tells Jess and Lily that the Boggits are going to destroy the Treasure Tree. Jess and Lily use a hot air balloon to fly to the Treasure Tree to see what's happened. They hear that the Boggits have told Molly to go and get them some water from a huge waterfall called Sparkly Falls. The girls go to the waterfall and rescue Molly. The Boggits go away and Jess and Lily fix the tree and all of the animals have their fair. Jess and Lily have a fun time and then go back home. 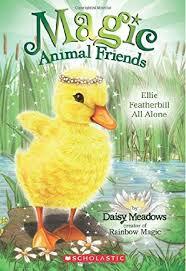 Q: Can you please tell me what the third book, Ellie Featherbill All Alone is about? A: Goldie leads them back into Friendship Forest. Jess and Lily go to a river where a duck named Ellie is going to have a birthday party. When they get to the river they see a boat with Boggits jumping on it and throwing everything around. The ducks fly across the river to Jess and Lily, count their ducklings, and tell the girls that one of their ducklings is lost. One of the ducklings tells them all that Ellie was hiding in a bucket on the boat. Jess and Lily get on a raft and follow the boat but they soon get lost in all of the reeds. After awhile they find their way and see the boat, now empty of Boggits, blocking their way. Just then Goldie comes and tells them that a maze is up ahead. Then Grizelda comes and tells the girls that the Boggits are going to mess up the river so that all the animals in the river will be driven away. Goldie tells the girls that in the middle of the maze is a spring. They go into the maze and stop the Boggits from messing up the river and also save Ellie. At the end of the book they have Ellie's birthday party and go back home. Q: Can you please tell me what happens in the fourth book, Bella Tabbypaw in Trouble ? A: Jess and Lily go back to the forest and have a sleepover with Goldie and a baby cat named Bella. When they wake up they find Bella is gone. They look for Bella and find some caves. They find Bella with the Boggits who are destroying the caves. When the caves are destroyed, all of the animal houses will crash down. The girls and Goldie rescue Bella, drive the Boggits out of the cave, and chase them into a swamp. Then Grizelda comes and the Boggits like the swamp so much that they will not do anything for Grizelda. The girls then go home. Q: Who illustrated these books? Q: Did you think any of the pictures inside were scary? Q: Did you like the series? Q: Do you think your siblings would also like these books? 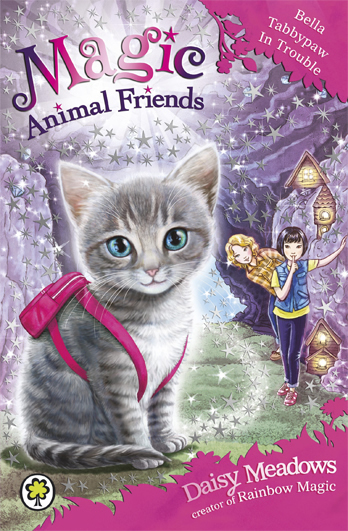 To learn more about this series you can visit the Magic Animal Friends Website. The site would indicate that more books will follow in this series. Many thanks to Scholastic Books who sent copies of the above titles our direction in order to facilitate this review. We received no additional compensation for this post and all opinions are 100% our very own.